this is lovely! very entertaning and good-sounding tiny-intro. That was real fun on the big screen! 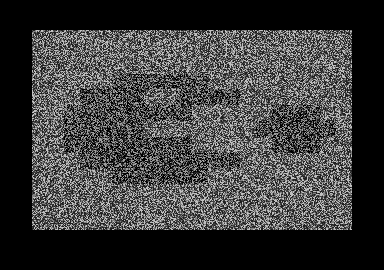 Nicely done tv noise and with sound and pacman characters :). Cool idea for 512b boot!!! One of the best bootsectors from Outline! How did you manage the noise effect? This was a really good surprise and my favourite of the compo. For a bootsector intro it's very original and stylish. Having decent sound with such a small size is a big plus as well. Original and cool! Thumbs up! page created in 0.015789 seconds with 15 queries.